Researchers at the University of Birmingham have discovered that the mass extinction seen in plant species caused by the onset of a drier climate 307 million years ago led to extinctions of some groups of tetrapods, the first vertebrates to live on land, but allowed others to expand across the globe. This research is published today in the journal Proceedings of the Royal Society B.
Emma Dunne, from the University of Birmingham's School of Geography, Earth and Environmental Sciences, said: "This is the most comprehensive survey ever undertaken on early tetrapod evolution, and uses many newly developed techniques for estimating diversity patterns of species from fossil records, allowing us greater insights into how early tetrapods responded to the changes in their environment." 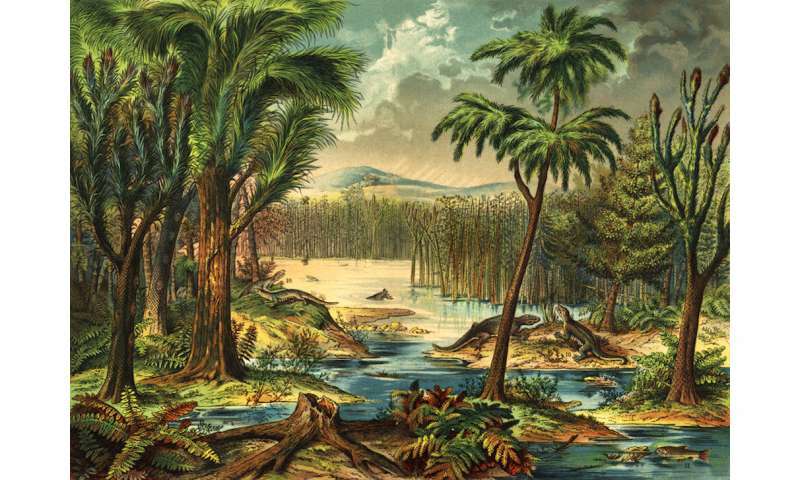 Dunne continued: "We now know that the rainiforest collapse was crucial in paving the way for amniotes, the group which ultimately gave rise to modern mammals, reptiles and birds, to become the dominant group of land vertebrates during the Permian period and beyond."